With the BIT.TRIP series, Gaijin Games has somehow been able to take gamers back to the early days of video gaming while at the same time combining this nostalgic experience with a whole host of challenging and engaging gameplay elements. BIT.TRIP FLUX marks the sixth and final release of the series, and while it might look like little more than a slightly enhanced version of their first release BIT.TRIP BEAT, there's actually a lot more going on underneath the surface for gamers who are willing to explore things a bit more in-depth. Fans of BEAT should feel right at home with the gameplay setup in FLUX. Many of the same elements remain intact, although you will find your paddle on the right side of the screen this time around rather than the left. Your basic goal also remains the same: use your paddle to bounce back the intense barrage of beats being hurled your way without letting too many get past you. And while this might sound quite easy enough, you'll find that the frenzied pace and eye-crossing patterns will soon give you all that you can handle. And when you toss in the brand new Avoid Beats, which basically look like circular beats, but will do heavy damage to your paddle if you touch them, you'll find that you've got far more things to worry about than just bouncing beats back. You control your paddle by holding the Wii Remote on its side and twisting it forwards and backwards. This will move your paddle up and down the left side of the screen much like the vintage Pong games. You can even bring in a second player to help you out with a paddle of their own. The barrage of beats will begin flying your way, gradually becoming more intricate in their movements and speed. 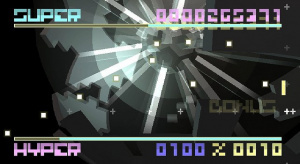 Bouncing back consecutive beats will not only increase your scoring multiplier, but also increase your Mega Meter. Not only will this help you score much higher amounts of points, but it will also allow you to ramp up your current mode, even reaching the deadly Meta Mode if you're skilled enough. As you ramp up to loftier modes, you'll be treated to an increasingly higher quality audio and visual presentation. Of course with the good comes the bad. The other gauge you'll have to keep an eye on is the Nether Gauge. This gauge will decrease as you miss beats. Each time you empty the gauge, you'll ramp down in mode which will reduce the audio and visual quality, even taking you all the way back to the black and white playing fields of the Pong games of old. Let the gauge run out of juice in Nether Mode and it's a quick reset back to the last checkpoint to begin again. There are basically three worlds to conquer in FLUX, but this time you won't have to run through them in the same marathon fashion of BEAT. Gaijin Games have tried to make the worlds a bit more accessible this time around by including checkpoints. Now before you fly into a frenzy, please keep in mind that the game is still very challenging, even with the checkpoints, you just won't have to stare at the screen without blinking for 15 straight minutes at a time without a break anymore. After you've cleared the 8th checkpoint you'll get to face off in a boss fight, all of which are far more interesting in their design and execution this time around. It's difficult to believe that such a simple control scheme can turn out to be so enjoyable, but Gaijin Games have once again squeezed every ounce of playability out of the old-school paddle control system. Not only is the response of the paddle absolutely dead-on, but the twisting motion allows the entire experience to become so intuitive that you can almost act completely on instinct in the later more hectic levels. Combine this flawless control system with a smooth, albeit fairly significant climb in difficulty, you've got a game that is extremely challenging without being frustrating. Even as unique as BEAT was from a visual standpoint, nothing can prepare you for the flashy and absolutely mesmerizing background visuals FLUX has in store for you. Not only are the swirling and pulsating surroundings perfectly befitting the action taking place in the foreground, but at times they will even play tricks on your eyes if you're not careful. Even the beats themselves have become far more visually appealing this time around with smooth and colorful lines streaming from them as they swirl around the screen. If you thought your eyes were overloaded in BEAT, you haven't seen anything yet. It would be impossible to talk about a BIT.TRIP title and not mention the amazing music the various titles have featured. If it's one aspect of game development that the folks at Gaijiin Games have a firm handle on, it's choosing the right musicians to score their games. Petrified Productions has managed to capture the exact tempo and mood for each section of the game and there's not a track in the entire game that won't thoroughly entrance you. 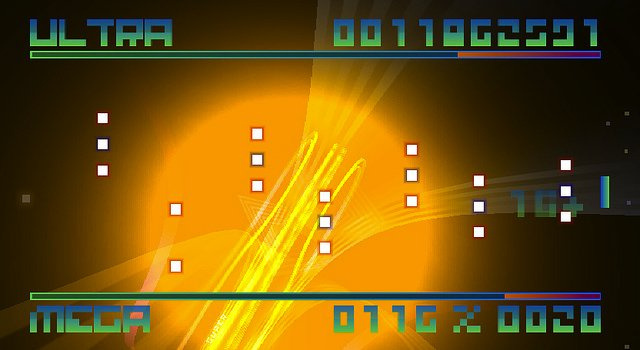 To say that BIT.TRIP FLUX is a fitting sequel to BEAT would be a gross understatement. While both games share many of the same gameplay elements, the sheer magnitude of improvements the developers have made to this final release is staggering. Not only have they improved virtually every single aspect of the game, but they've also managed to take it so far as to make the entire experience feel brand new all over again. 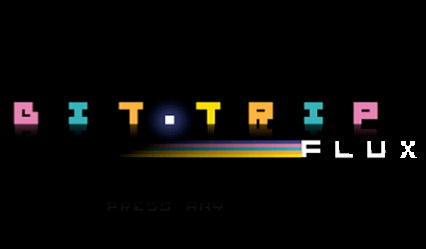 BIT.TRIP FLUX is a great example of how old-school video gaming can be every bit as relevant today as it was 30 years ago and provides the perfect ending to one of the most unique and engaging video game series ever created. Great review, I'm so FLUXing excited for this game! Insta-download at 11pm tonight. 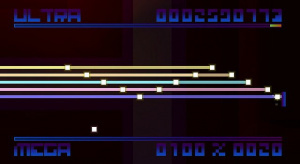 I didn't really like Bit Trip Beat, so probably won't get this one. Nice review though! It doesn't sound that different from Bit. trip beat but it still sounds like a great game. Wow! Excellent review Corbie. I'll be getting this later down the road though (along with RUNNER and FATE). I'll probable get void this weekend after I finish Excitebots. The only one in the series I didn't get was FATE and the only one I really didn't like so far was CORE so this should be good. I was getting a bit bored after RUNNER strangely because I lost patience with the difficulty. As fun as these games are I never end up finishing them! This review has definitely helped bring me back to the series. I've got some Wii Points spare so I'll definitely be downloading this sometime tomorrow. Maybe after I get home from going to the 3DS demo thing if I end up going to it! Great review Corbie. The Bit Trip series has been the standout on WiiWare for me, heck it's one of the best things on Wii full stop. Judging by the trailer and this review this looks like a fitting finale. The highlights for me are the music and background changes as you string combos together. Bliss! Bit Trip games on the 3DS anyone? If Gaijin can utilise the gyroscope and 3D together, which is possible based on a brief play I had of Monkey Ball at a preview event, then it could be something truly special. Exactly as I anticipated. Better than BEAT is what I was hoping for. I'm not expecting an insanely significant jump in quality, but it sounds like they put in their all. I finally just beat all of the first 5 BIT.TRIP games, so bring it on! I'm interested in this. 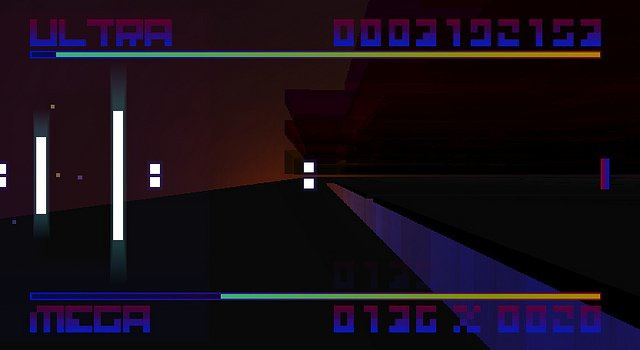 I've played the Bit Trip Beat demo constantly - yet have neglected to buy it. I guess I'll pass on that now and maybe get this. Beat is like, the best, which is why this is like, the new best. 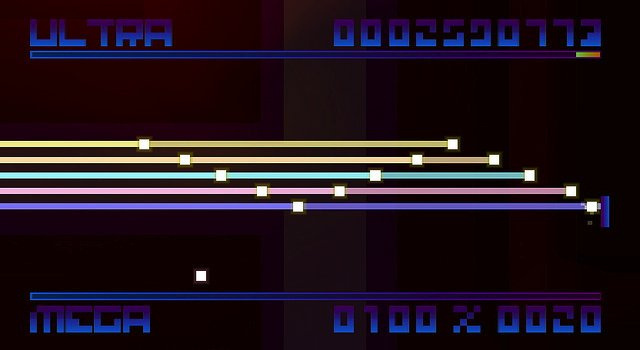 If I get a "game over", can I still claim my high score, or work the checkpoints the same as in Runner (so that you instantly begin again)? I've only played BEAT... I want to play the rest of them but the sheer volume of them at this point makes it too expensive... =/ What a funny circumstance. Awesome. I'll get this after I get Beat, RUNNER, Sin and Punishment......and the three Phoenix Wright games. @8. Whaaaaaaat?! You didn't get fate?! Fate's the second third best game in the series! Am I crazy for wishing this was 600 points like the original? BEAT is definitely my favorite (though RUNNER is its own insanely awesome animal) so I'm happy to complete the cycle with this. Now, Gaijin: What's next?? My wish--team up with Skip and Q games to dream up the next series of Art Style titles for 3DS. Make it happen. To be honest I wasn't really a fan of FATE. In fact, I still haven't beaten it, not because it's too hard, but because I just don't feel like it. So I was a bit worried what the next entry would be like. But I'm happy to say I will be buying this the instant I can And what luck, I happen to have 800pts left over! I really liked Runner and Fate, but I think Beat's a little too tricky for me. If I get some more wii points, I'll try to buy Flux. The controls in Beat on Wii are very frustrating to me. Too many times I feel like I see the Game Over screen because of controls, and not skill. The next time I see it on Steam I will be purchasing it, as I feel that the Mouse controls will be a better fit for myself. Sweet review! I shall await the final bit trip title . Well it's fairly "enlightening" shall we say. Good review. I think you can mention the messages/themes in a review without spoiling them, though. Spot on review, Corbs. Just downloaded this and really enjoying it, though I was always gonna get it anyway as I've got all the others Music's awesome too. This, more than any other game I can think of, is a storyline you need to experience for yourself, especially the unique way it's presented in the games. And as I've said before, I don't like to mention storyline in my reviews. Story in Bit.Trip games is generally difficult to explain. At least without getting all spoiler-y. @cyrus_zuo Actually, you can play with 2 players! Alex Neuse here. I hope y'all like the game and the overall series! It was fun making it for you! Now put those headphones on and plug in to some FLUX! (If you're in Europe). US folks do that on Monday. @Corbie I just meant maybe mention that there is a whole nother layer to it. Sorry I wasn't very clear. And yay, return of CV! 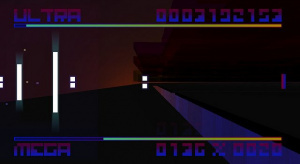 The game was mislabeled as 1-player when in fact it's actually 2-player. You can bring in a second player to help you out. I want to play the others but I hate playing them out of order and I got stuck on Beat! It gets so freakin' hard, then you have to start all over. I should try it again, I gave up after a couple days out of frustration, then there was so much other great stuff since then, I never went back. By the way I love bit.trip series and had to have this one anyway. I smell a retail compilation. Just curious, do the checkpoints give infinite continues or are they points based like those in Void? Nice review Corbie. You managed to answer pretty much every question I had about the game. Given that BEAT is still my favorite of the Bit.Trip series, I'm absolutely dying to get my hands on this one. Too bad my pockets are empty. Oh Thursday, will you never come? Also, I never understood why people found Beat to be so hard. 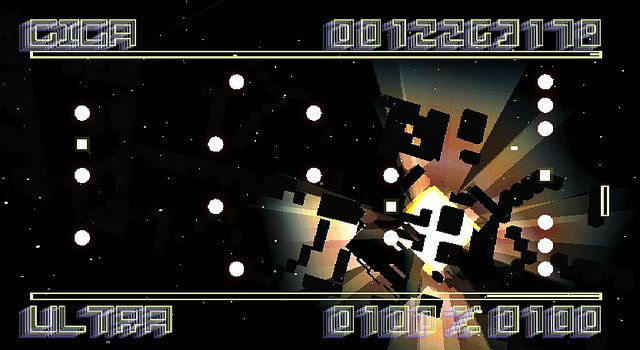 Of course it's difficult until you learn the patterns, but you pretty much get a little further every single time you play, until eventually you can practically finish the whole game with your eyes closed (okay, not THAT easy, but still pretty darn simple with open eyes). It's just basic muscle memory and rhythm. Same deal with Runner and Core. Void and Fate are the kids that, while you still love 'em, are starting to look a lot like the milkman. @Alex_Neuse: Thanks for making these games. I have beaten all of them and loved every second of it. I show these games off to all my friends. Please make an awesome and unique 3DS game! I'd like it if they'd release a Wii disk with all of bit trip on it. Bit Trip Collection anyone? I have finished Flux today, and I have really loved it. I have yet to play a single Bit. Trip game. Perhaps I'll start with this one.